The Groton Conservation Trust, with funding from a grant from The Community Foundation of North Central Massachusetts, embarked on a project at the beginning of July to study different invasive species removal techniques at two different properties in Groton, the Bates Land and Shepley Hill. The project has been conducted under the direction of trustee David Black with assistance from trustee Michelle Ruby. Most of the work has been carried out by technician Sarah Black and intern Nicole Fronsdahl. As of July 29, the mechanical removal at both properties is complete. 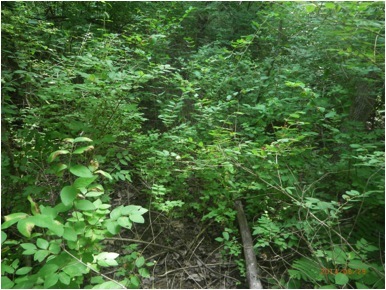 The two properties differed drastically in the type and size of vegetation encountered. While both had many of the same species present, common buckthorn (Rhamnus cathartica) and Japanese barberry (Berberis thunbergii) were the most common at Shepley Hill. 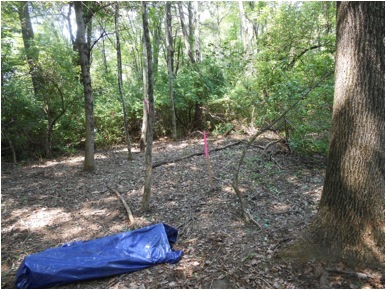 As of August 6, the smaller brush piles at the Bates Land have been removed using a portable chipper. The larger brush pile will be left to decompose. We plan to recruit volunteers to help chip the multiple smaller brush piles at Shepley Hill. We have been working with an herbicide application company to set up a time to conduct the cut-stump and foliar spray herbicide applications. We are hoping to do this in mid-late August, but the exact date will depend on weather and availability. More detail about the project, maps and photos are available HERE. This entry was posted in Land Management, News and tagged Bates Land, Invasives, Shepley Hill by Groton Conservation Trust. Bookmark the permalink.